How's this for an entrance? 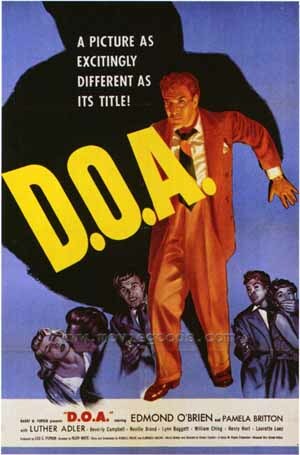 In the opening minutes of D.O.A., Edmund O'Brien staggers into a police station, asks directions to the homicide division, then plops into a chair. "I'd like to report a murder," he rasps. The attentive investigator asks: "Who was murdered?" O'Brien replies: "I was." No kidding. O'Brien plays Frank Bigelow, a small-town accountant who gets into big-time trouble when he takes an impulsive trip to San Francisco. He makes the journey primarily to avoid the marriage demands of his lovestruck secretary (Pamela Britton). Unfortunately, while he's having a drink with new friends in a jazz club, someone gives him a toxic cocktail. The next morning, Bigelow wakes up with a killer hangover, so he visits a local hospital. That's where he gets the bad news: He's been given a slow-acting poison, and has just a day or two left to live. In D.O.A., O'Brien's Bigelow is a prototypical noir protagonist, a not-entirely-innocent bystander who's unfortunate enough to be in the wrong place at the wrong time. At first, he suspects his death sentence was handed down by an elegant smuggler (Luther Adler) with whom he's had indirect business dealings. But the answer to the mystery really lies in a bill of sale that Bigelow notarized back home. The document is potentially incriminating evidence, and two co-conspirators want to destroy all trace of it. Throughout a long flashback bracketed by Bigelow's fateful visit to the police station, D.O.A. shows how knowing you're about to die can be empowering, if not liberating. The movie refrains from stating the obvious, but there's little doubt that Bigelow behaves with uncharacteristic bravery while hunting for his killer only because he knows he has nothing left to lose, no one left to fear. He even keeps his cool during confrontations with the smuggler's chief henchman (Neville Brand), a grinning psychopath who does his best to make Bigelow's short life miserable. O'Brien, always a dependable character actor, gives one of his finest performances here as a man who wants to make every minute count while he's running out of time. He's at his best in a surprisingly affecting scene that has Bigelow phoning his secretary, and trying very hard not to tell her what's wrong. From the look on his face and the pauses in his conversation, you can tell he's thinking about how different things might have been had he not been so quick to avoid a long-term commitment to this woman who loves him. Polish-born Rudolph Mate (1899-1964) started out as a cameraman for the great Carl Dreyer (The Passion of Joan of Arc) before moving to the United States to work with such notables as Alfred Hitchcock (Foreign Correspondent) and Ernst Lubitsch (To Be or Not to Be). As a director, his resume includes everything from sci-fi spectacle (When Worlds Collide) to Tony Curtis star vehicles (The Black Shield of Falworth). But he remains best known to film buffs for D.O.A., an engrossing 1950 drama that sustains an unsettling atmosphere of noirish dread even during scenes shot in broad daylight.